While I was working on this little guy (details soon to follow), I realized I usually only show pictures of finished amigurumis (like Mario and Sonic, Totoro, and the striped giraffe). 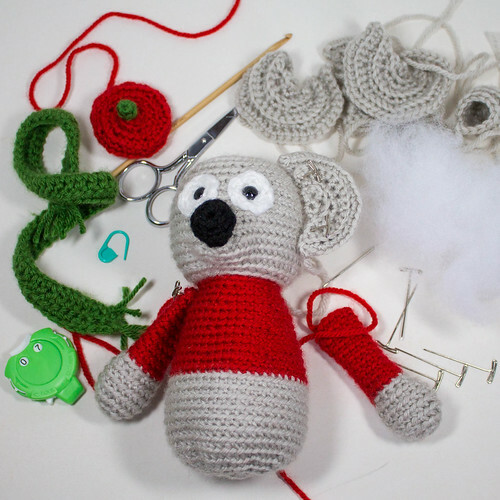 So here's a photo of an amigurumi in the putting-together stage, a process I find pretty amusing. I always feel slightly like a mad scientist with all the body parts laying on the table with all my different surgical tools. As I'm very focused on the job I can see where it'd be handy to have a nurse or an assistant... "Igor, scissors! Needle! T-pins!" I also find it funny how the little doll takes on a life of it's own as soon as the eyes are attached. "It's alive!!! Mwahhhhahaha!" Sometimes I regret having put on the eyes before I'm done stitching all the openings closed or attaching certain limbs; "well, this is awkward!" Haha! Anyone else feel like Dr. Frankenstein when making amigurumis? LOL yes, it is kind of spooky when you have all parts ready and start stitching!! Poor little ami guys :) Especially with eyes!! I love seeing this little guy coming alive! I hope it doesn't freak him out to see you sew on his arms and legs!!! .....but I really understand what you mean!!!! So cute! I struggle with these because even if I use a stitch counter I get those little SC all mixed up, so I give up! Must try again, this is cute!